Vacation in SihanoukVille SihanoukVille, Cambodia. The main tourist destination in Cambodia, after the magnificent temples of Angkor Wat. Beaches, islands, resorts and Cambodian culture. SihanoukVille is the fastest growing city in the country. Also home to the main port for Cambodia, and soon the largest airport in the country. (but no direct flights currently). Soon to be a large casino playground and golfing community. And Wintertime, November through February, SihanoukVille really "Shines". 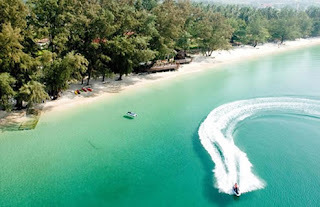 Currently, there are only 3 world class resorts in SihanoukVille, with many more planned or in progress, especially on the islands. SihanoukVille is located on the Southern Coast of Cambodia on the Gulf of Thailand. Surrounded by small hills and islands, it's about a 3 hour drive from the Phnom Penh airport. Most of the activities here surround the beaches and islands. There's also over 100 foreign owned restaurants, hotels, and clubs in town, catering to most tastes.